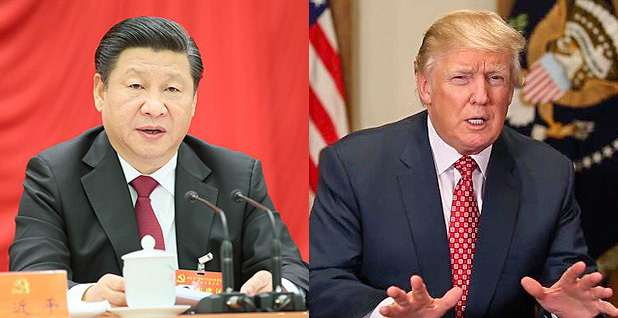 Chinese President Xi Jinping (left) meets today with President Trump. Climate change is not on the agenda. Photos courtesy of Lawrence Berkeley National Laboratory and @POTUS via Twitter. The last time a Chinese and an American president met, climate change was the brightest spot in the world's most important bilateral relationship. But as Chinese President Xi Jinping prepares to visit President Trump at his Mar-a-Lago estate in Florida today, global warming and the fate of the Paris Agreement are now points of tension between the two superpowers. "I think the other thing that's been said about our climate change policy as far as the diplomacy goes, it requires international efforts," said Susan Thornton, acting assistant secretary for the State Department's Bureau of East Asian and Pacific Affairs. "You'll be hearing more about us on that front." Thornton said it is unlikely that climate change will come up during the meeting in Florida, at least "in detail." The shift underscores the dramatic change in political temperature on climate change in Washington. President Obama spent a significant part of his second term galvanizing international efforts to reduce greenhouse gas emissions — often in tandem with China. He pressed former President Hu Jintao as well as Xi to modify longtime Chinese resistance to curbing climate pollution and laid the groundwork for the world's two biggest emitters to jointly cut carbon emissions. The U.S.-China relationship became key to the ultimate shape of the 2015 Paris Agreement, which both leaders signed. Trump, by contrast, has called climate change a hoax "created by and for the Chinese." It's unclear where the Trump administration will find as much common ground with China. A senior White House official told reporters in a briefing that the two will jointly address "a whole grab bag of daily issues" but did not offer any specifics. "All signatories should stick to it instead of walking away from it, as this is a responsibility we must assume for future generations," Xi told a conference of global investors in Davos, Switzerland, about the Paris Agreement days before Trump took office. Last week, China's state-sponsored Global Times ran an article criticizing "Washington's political selfishness" in proposing to leave Paris. Trump campaigned on a promise to "cancel" U.S. involvement in the Paris deal but has since faced pressure from factions within the administration to stay. A decision is timed for the Group of Seven leaders' summit in Italy next month. Still, even if the United States remains a signatory to Paris, domestic ambition is a thing of the past. Last week, Trump signed an executive order rolling back U.S. EPA's Clean Power Plan and other moves that supported the United States' Paris pledge, and he is considering scaling back its emissions target if it does stay inside the deal. China has reaffirmed its own pledge. But the government has also expressed unease about assuming the mantle of global climate leadership. The promise to peak emissions by 2030 is based on decreased coal use and efficiency measures that are enshrined in the country's 13th five-year plan and motivated by domestic concerns ranging from unhealthy air pollution levels to a strategic reordering of its economy. Reports show China can easily meet its pledge, and there is some evidence that emissions might already have stopped growing. But the Paris promises were intended to be a starting point, and the deal demands new action to meet its long-term objectives of avoiding harmful warming. Countries have agreed to review their commitments in three years and consider making stronger ones. Some observers worry that Trump's retreat might then have a dampening effect, particularly among developing countries that long have insisted that the rich world move first to contain emissions. "Whether the Chinese would go beyond the current commitment is much less certain," said Jane Nakano, a senior fellow for the energy and national security program at the Center for Strategic and International Studies. "If anything, I would bet against the possibility [that the Chinese would take] actions and measures that they might have introduced or undertaken had they had a U.S. administration across the table that still had climate change as one of the top priorities." Others are more sanguine about China's future ambition, though opinions differ on whether it will drive the country to formally commit to a tougher target. "I think there will be less juice in the political machine if the U.S. isn't there as it has been before this year," acknowledged David Waskow of the World Resources Institute, though he added that China and other nations have domestic reasons for increasing their ambition even as the United States pulls back. Paul Bodnar, former director of energy and climate change on the National Security Council, said China may find that it can move its peak year forward without new action if domestic industrial reforms already in the pipeline deliver results early. It's less clear whether China will boost its pledge accordingly. "Without the U.S. at the table, really, what is to incentivize China to crank up the ambition of its official targets in line with its internal estimates of what it can achieve by when?" he asked. The European Union has ramped up its own collaboration with China on climate change, but Bodnar suggested that its leverage might be limited. "I would observe that it took the U.S. to bring China to the table," he said. Conservatives often argue that China's current pledge doesn't require it to act until 2030, while the United States has pledged to cut its greenhouse gas emissions 26 to 28 percent below 2005 levels by 2025. Energy experts note, though, that laying the groundwork for a future power grid that doesn't rely on increased coal use is a substantial undertaking for China. The world's most populous country must add a gigawatt of energy capacity every week. While much of that will be coal in the early years, it also requires record levels of nonemitting generation. The United States and China set up numerous joint initiatives during the Obama years aimed at developing technology and best practices, but now their future is uncertain. One of the most important was the U.S.-China Clean Energy Research Center, a virtual research initiative established in 2009 and involving thousands of U.S. and Chinese participants in a variety of technical fields. It is equally funded by the United States and China, with U.S. funding coming from DOE and the State Department. That initiative and others, like the Climate Change Working Group, face long odds of survival under Trump's proposed budget. "My sense is that a lot of those departments are either going to disappear or be cut back dramatically," said Joanna Lewis, a professor at Georgetown University. She said Chinese participants in those and other programs are waiting to see how the budget battles play out, but in the meantime are struggling to connect with U.S. counterparts since the transition. "The parallels to all of those agencies on the U.S. side are still existing on the Chinese side, and many of them are growing," she said. "It's not balanced."